Parc Palais is a marine-themed condominium project with luxurious facilities and an aquarium sited by the pool. Each unit has a good-sized balcony so you can sit out and relax. 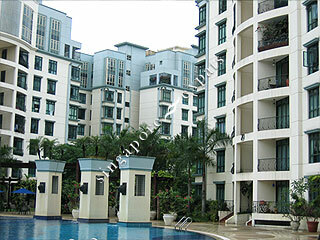 The layout of each unit is square in size, therefore it is very popular among expats. It is close to the Pan Island Expressway (PIE), AYE and Bukit Batok MRT Station, Bukit Panjang Shopping Mall, The Rail Mall and West Mall. A mere 5 minutes bus ride is all it takes to go to the Bukit Batok MRT station and shopping mall. It is within walking distance to the HDB shops and markets located in Hillview Avenue. Peaceful but minutes walk to the mall and mrt station. Close proximity to bt timah road and schools. Freehold property at leasehold prices! Cosy, bright, airy and quiet with good size and spacious bedrooms. Parc Palais is a freehold development located at 47 Hume Avenue, Singapore 598748 in District 21, close to Bukit Gombak MRT Station. Completed in 2000, it has 9 storeys and comprises of 517 units. Parc Palais is close to Bukit Batok Nature Park and Bukit Timah Nature Reserve. Parc Palais has a host of facilities, which includes 24 hours security, covered car park, wading pool, swimming pool, BBQ pits, gym, tennis and badminton courts, clubhouse, karaoke room, and playground. Several bus services are within walking distance. It is also located close to several schools such as Lianhua Primary School and Assumption English School. Restaurants and eating establishments are sprawled across the area and residents can get their daily necessities at The Rail Mall, located just a short walk away. For vehicle owners, it takes about 20 minutes to drive to either the business hub or the vibrant Orchard Road shopping belt, via Ayer Rajah Expressway and Dunearn Road respectively. Resort feel and cosy. One of the rare condo nestled in the greenery of bukit batok nature reserve and bukit timah nature reserve. Spacious and wonderful facilities. Very good place for living, great neighborhood. i've been live here for a month. Its a great place to have a peaceful life n comfort. All facilities are suitable for family with kids and student. The maintenance itself is also very strict. So u will never worry fr the dull or anything messy. Great condo with excellent variety of facilities. 20 mins by bus to city/orchard.